[166 Pages Report] The revenue management market is estimated to grow from USD 9.27 Billion in 2015 to USD 21.92 Billion by 2020, at a Compound Annual Growth Rate (CAGR) of 18.8% during the forecast period. The deployment of revenue management solutions help the organizations with the ability to provide personalized pricing and tailored products to customers depending upon their attributes. The report aims at estimating the market size and future growth potential of the market across different segments, such as solutions, services, applications, end users, deployment type, and regions. The base year considered for the study is 2014 and the forecast period has been considered from 2015 to 2020. With the increasing adoption of cloud-based deployments in Small and Medium Businesses (SMBs) and enterprises, the demand for revenue management solutions has grown tremendously across all the countries. During the forecast period, the revenue management market is expected to grow at a moderate pace. Presently, North America is the largest market for revenue management solutions and services. The revenue management ecosystem comprises service providers, solution vendors, and platform providers. Some of the key players that offer revenue management solutions and services are Accenture PLC, Amdocs Inc., Ericsson, Netcracker Technology Corporation, Oracle Corporation, CSG Systems International, Huawei Technologies, Redknee Solutions, SunTec Business Solutions, and SAP SE. MarketsandMarkets forecasts the revenue management market size to grow from USD 9.27 Billion in 2015 to USD 21.92 Billion by 2020, at a Compound Annual Growth Rate (CAGR) of 18.8%. Increasing customer awareness about revenue management tools, expanding subscription base, increasing cloud-based deployments of revenue management solutions in Small and Medium Businesses (SMBs) and enterprises, and increasing demand for system integration among organizations are the major driving factors for the growth of this market. The revenue management market is broadly classified by application area into aviation, real estate & construction, media & entertainment, telecommunication, transportation & logistics, manufacturing, energy & utilities, retail & wholesale, and tourism & hospitality. Media & entertainment, energy & utilities, and real estate & construction are the fastest-growing application areas in the market. The media and entertainment sector is the fastest-growing application area as the media houses are deploying the revenue management technology, which helps these companies in taking inventory allocation decisions based on supply, demand, and opportunity tradeoffs. Pricing and revenue forecast management is expected to dominate the solution segment in the revenue management market during the forecast period as it helps the firms in devising their pricing strategies, along with revenue forecasting, and thus helps in budget formulation for the enterprises. Data management solution is the fastest-growing solution in this market because firms are increasingly deploying this solution to manage and store the vast amount of data generated from various revenue streams, which is then analyzed under revenue analytics to frame a suitable future revenue management action plan. 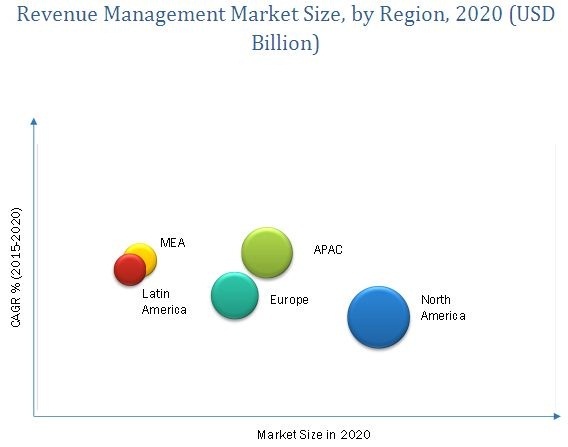 The revenue management market is segmented across five regions, namely, North America, Asia-Pacific (APAC), Europe, Middle East and Africa (MEA), and Latin America. The analysis shows that the spending on revenue management technology is increasing globally due to the increasing Information and Communications Technology (ICT) integration across different application areas, especially in the developing regions. North America is projected to dominate the market during the forecast period due to technological advancements and early adoption of revenue management solutions and services in the region. The APAC market is expected to grow at the highest CAGR between 2015 and 2020. The primary driving forces for this growth are huge technological spending and penetration of revenue management solution and services in manufacturing industries in countries such as China, India, and Japan. The current revenue management systems are incapable of tackling the changing market conditions and do not support many cross-platform applications. This acts as a major restraining factor for the growth of the revenue management market. However, worldwide increase in the IT spending is expected to provide significant growth opportunities. On a strategic front, many companies are utilizing different growth strategies, such as mergers & acquisitions, partnerships & collaborations, and product development to increase their share in the market. Some of the major technology vendors include Accenture PLC, Amdocs, Inc., Ericsson, Netcracker Technology Corporation, and Oracle Corporation. Amdocs Inc., a key market player partnered with companies such as Crnogorski Telekom and Singtel and launched a new product portfolio, Amdocs CES 9.3, to gain a stronghold in the market. Also, Ericsson, adopted inorganic growth strategies by acquiring Sentilla Corp. and MetraTech Corp. to expand its presence in the Americas. 13.8 CSG Systems International Inc.
13.9 Huawei Technologies Co., Ltd.